Every member of our family could live on a diet consisting of only the green goodness of avocados. For one nine month period of my life I did, in fact, survive on a diet of only avocados. When pregnant with Nathan I had the most severe form of morning sickness, hyperemesis gravidarum which lasted the entire length of the pregnancy. Allergic to the most common forms of prescription anti-nausea medicine, I spent a lot of time in the hospital hooked up to an I.V. I lost over 25 pounds from all the vomiting, and when I left the hospital with my baby boy, I weighed less than I did before I got pregnant (which made most of my mommy-friends very jealous). The only thing I could keep down was avocado. So I ate it every day! It was no surprise that when we introduced baby Nathan to mashed avocado he gulped it down and begged for more! Whenever I buy them, they rarely make it into guacamole or sandwiches... 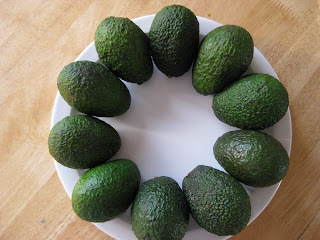 I cut one open and I'm surrounded by my fellow avocado-addicts, demanding a slice to eat with their bare hands or straight out of the skin with a spoon. We're counting down the minutes until these little beauties are ripe enough to eat!